SPECIAL OFFER: So Much SNOW & the price is right! Welcome to The Range. The snow is already incredible this year! It is truly a winter wonder land! You do not want to miss booking this property NOW before premiere ski pricing goes up! Wake up to the entire snowy 10 mile range outside your window. Sip your coffee on the back deck as the sun casts its first pink glow on the mountain peaks! This home has THE BEST VIEW in the area. You will be in the middle of it all. The gondola is 5 minutes away (for skiing). Snowmobiling and dog sledding is right at the bottom of our hill. Mainstreet Breckenridge with all of the delicious restaurants and awesome shopping is a short drive down the way. When you return from your day of mountain adventures, you can enjoy soaking your tired muscles in the hot tub with the most amazing view in Summit County. Throw on some tunes to listen to as you soak in the mountain view hot tub! If you're a music fan - you're in business. The home is equipped with SONOS (home music system). Anything you can imagine is at your fingertips - in any room that you want it. Catch the game on the 60’ HDTV in the Great Room. With the Classic Mountain décor, warm fireplace and amazing views-the whole crew will be enjoying this cozy spot! Then, get ready for games to begin! This home is engineered for fun. Imagine a parent vs. kids game night! The billiard room upstairs is reminiscent of an old mountain saloon. The game room in the basement is equipped with a 16' Shuffleboard - Big Buck Hunter - Golden Tee Complete (which also plays over 100 classic arcade games). If you want to have a BLAST with your friends and family - you can't do better than this! When you are ready to wind down-snuggle up and catch a movie downstairs on the 55’ Smart TV, while you watch an explosive sunset out of the ground level panoramic windows. At bedtime, you will be luxuriously comfortable. The home has 5 bedrooms and 5 & 1/2 baths. The Master is located on the main floor. 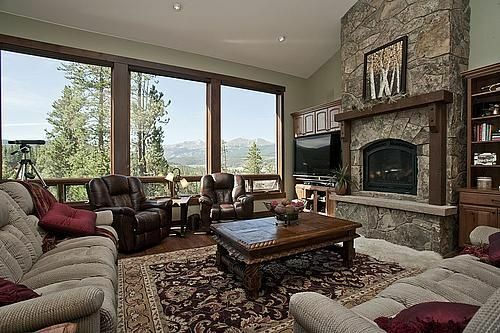 It has is own private deck that looks out onto the Breckenridge ski area and the 10 Mile Range. It has an enormous bathroom - equipped with a spa. The other bedrooms are on the walkout patio level. There is a Western style Bunk Room for the kids (or kids at heart). The Bunk Room has 2 full beds and 2 twin beds. Every bedroom has its own bathroom. Our guests return year after year and we know you will too-Welcome to The Range! Ann & Steve bought this lovely mountain getaway as a meeting spot for their children and grandchildren 8 years ago and have loved every moment they spend there. Originally from Missouri, our family is excited to now reside in Denver. It is a wonderful spot for our family to connect and make memories. Now we are excited to welcome you and your family and friends to do the same! Our family lovingly calls this home The Range because of the incredible view of the 10 Mile Range. Whether it is telling stories on the deck, playing shuffleboard/arcade games/pool, cooking in the gourmet kitchen or snuggling in for movie night-the 10 Mile Range is right there in all its glory! We love making memories at The Range and invite you to do the same! Gourmet Kitchen, Game Rooms (Pool Table, Shuffle Board, Arcade Games), Smart TVs, Warm Fireplaces, Hot Tub with a view, comfy and gorgeous decorating, 3 car garage, 2 decks with a view, lovely neighborhood in the woods-5 minutes from the golf course, skiing and Breckenridge dining & shopping! We simply have the BEST mountain views in Summit County!!! Quiet, secluded property on top of a hill overlooking Breckenridge ski area. 10 minutes drive to the skier drop off/parking. Great place for a family of 10-12 of a range of ages, from pre-schoolers to college students to married adult children. Kids can have their own space while parents can have quiet. Owners are very responsive to any questions or needs. We have stayed at this home 3 times over the past several years and will certainly plan to do so again. Only advice would be that if staying during winter and you are not accustomed to winter driving would recommend having a 4 wheel drive vehicle. The street and driveway are plowed and blown but the street and drive can still be a bit slippery. This is the perfect house for a large family. The kitchen is a dream kitchen for those who love to cook and the dining area is spacious to fit all. The views from the living room are spectacular. The hot tub after a day of skiing is just what our tired bodies needed. The game room was the perfect place to gather for fun. I can't say enough about this home. We hope to return again someday. I am so glad you enjoyed your stay! Please come back soon! Thank you for the perfect family getaway. Early risers enjoyed the views and peacefulness. Game room kept us entertained for hours, plus we got to bond together during the shuffle board tournaments. One place for 12 people ranging from 2-67, was beyond our expectations. My family gathered from 4 states and stayed at The Range. A wonderful time was had by all. There was more than enough space for all 12 of us to cook, eat, relax, be together. The kitchen had everything and the 2 sets of washers & dryers came in handy. The location was ideal for all of our excursions being halfway between Rocky National Park and Manitou Springs and places in between. And the 3 car garage made it easy to juggle cars. Many of us are flat landers and were awed by the views each time we looked out a window, after we caught our breath from climbing the stairs. We would stay at The Range again. I am so thankful that you enjoyed your stay at our home. Please come visit again! We loved staying at this home! It had everything we could have wanted and much more. The master suite was spacious, and all of the other rooms were very comfortable with their en-suite baths! We will definitely be back. Our home is about a 5 minute drive from the Breckenridge Ski resort, some of the worlds best skiing and snow boarding. We are also located about 10 minutes from Lake Dillon where you can enjoy sailing and other fun water activities in the summer.